Gorge Matland (in orange) and his helpers set up tree corrals on Friday. 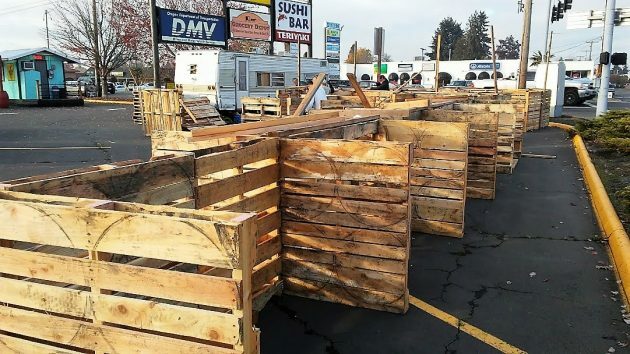 It’s not even close to Thanksgiving, but time waits for no one who counts on Christmas tree sales to help support his mission to help the homeless out of the cold and on their feet. 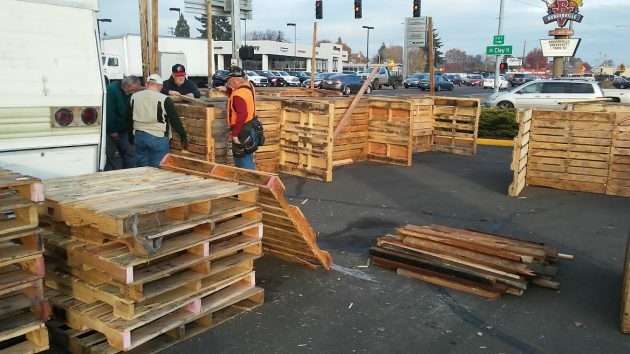 A crew from Albany’s Signs of Victory Mission spent part of Friday nailing together wooden pallets to make a framework for their annual tree-sales stand at Santiam Boulevard and Clay Street. It may seem early, but experience has shown George Matland, the leader of the mission, that it’s not too early when you want to sell a lot of Christmas trees. The mission buys its supply from a Christmas tree farm near Dallas. And this year they hope to match a previous year’s total and sell 2,000. Proceeds help keep the mission’s shelter and programs going. That’s crucial for a lot of people. Plenty of room for lots of Christmas evergreens to be displayed for sale. May god bless Signs of Victory. They provide choice for the homeless who, according to our mayor, are choosing homelessness as their preferred lifestyle. Whether you’re a Pagan or otherwise, please purchase your holiday tree from Signs of Victory. Every penny of your purchase will go to support homeless lifestyles. Been impressed by their efficient setup, teardown, and cleanup. Organization doesn’t happen by accident. Haven’t bought a tree in years, but I’ll give them money anyway.